Engine 34-10 - 1989 Mack MC/FMC 1250 gpm/1000 gal. 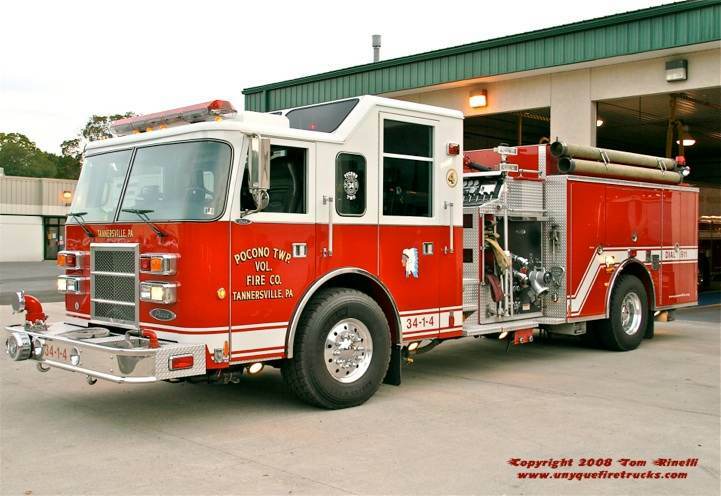 Operating as a pumper tanker, this rig features seating for five (4 with SCBA) and 1,000 watts of quartz lighting. 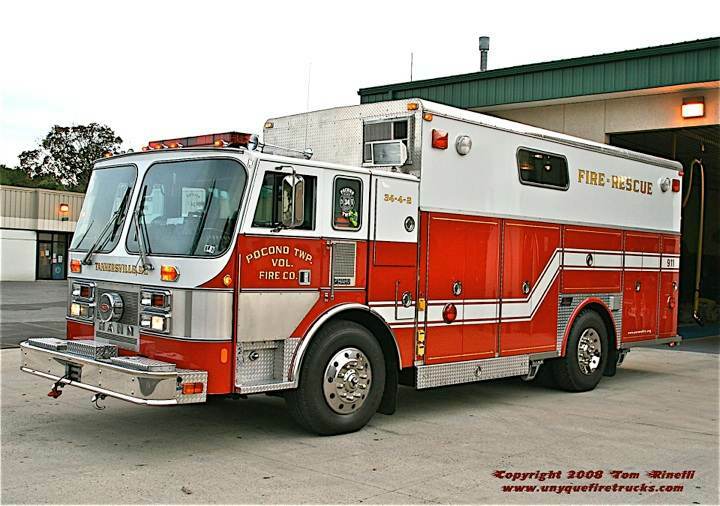 Equipment carried includes 250’ 1-3/4” & 3” pre-connects, 1,000’ of 5” LDH supply line, 40’ of ground ladders and a 2,000 gallon folding tank. 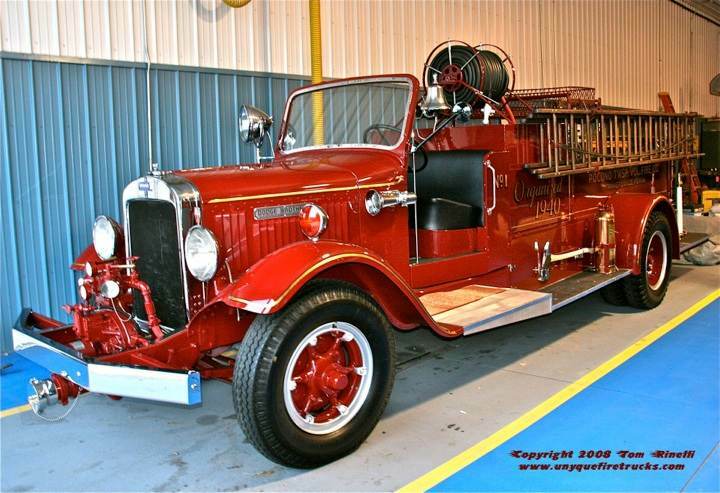 This rig was purchased used and entered service in September 1940 four months after the fire company was formed. Purchased for $600, it was originally a chemical wagon - the members of the company added a water tank to improve its’ capabilities. In addition to Pocono Township, this rig also served neighboring Jackson Township until the mid 1950’s when they formed their own fire company. It was fully restored to this pristine condition during 2008. 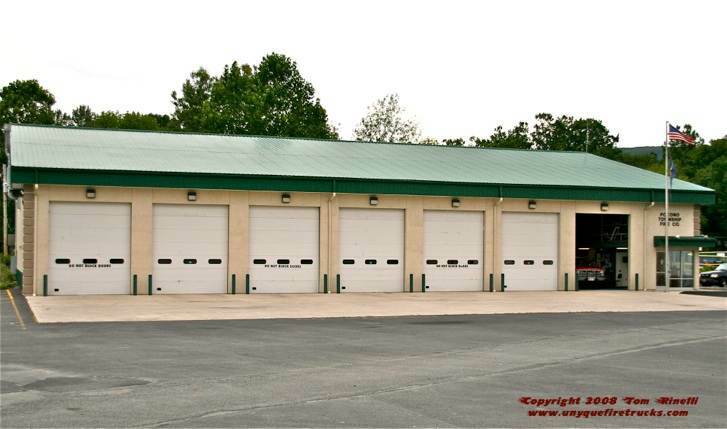 Pocono Township operates their entire fleet from this seven bay firehouse. Engine 34-1-4 - 1999 Pierce Dash 2000 gpm/1000 gal. 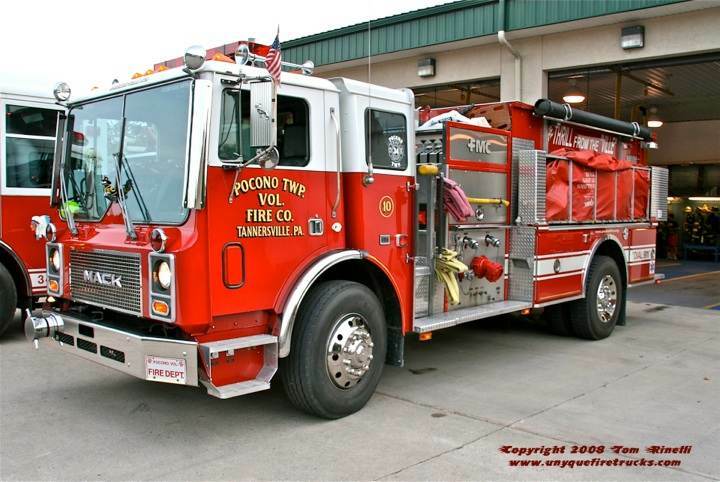 Entering service in 1999, this rig replaced a 1950 American LaFrance 700 series open cab engine. Featuring seating for eight (5 with SCBA), it features a 20 kw hydraulic generator & 4,000 watts of quartz lighting. Its’ equipment complement includes a 200’ 1” bumper trash line, 250’ 1-3/4” & 3” pre-connects, 1,000’ of 5” LDH supply line and a TNT combi-tool. 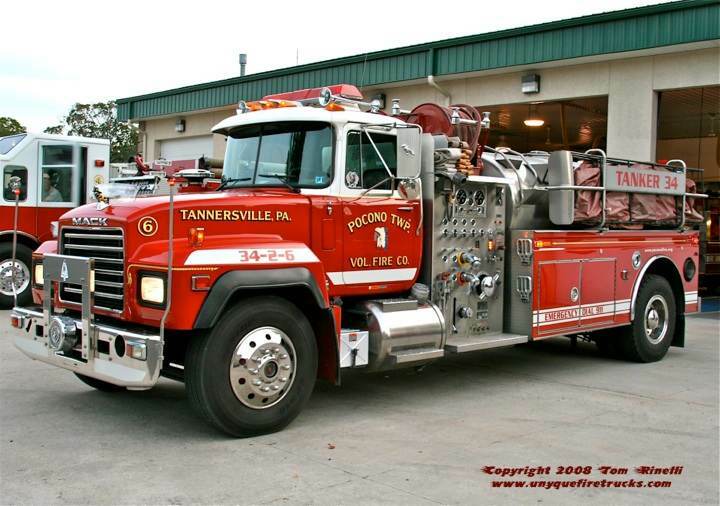 Tanker 34-2-6 - 1994 Mack/S&S 1250 gpm/1800 gal. Acting as both a supply pumper & nurse supply tanker during brush season, this rig is equipped with side & rear discharges and a 2,500 gallon folding tank. In addition, it carries 150’ 1-3/4” & 3” pre-connects, a 1-1/2” booster line, 200’ of 1-3/4” on a reel, 1 SCBA & 40’ of ground ladders. Replacing a 1975 step van, this walk-in style rescue features seating for eight (6 with SCBA), a front mounted winch, 25kw hydraulic generator, an air compressor, cascade system, command center & 8,000 watts of quartz lighting. It is equipped with TNT hydraulic rescue tools, air powered hand tools, Res-Q jacks, air bags and cribbing. Special thanks to Chief Mike Shay & the members of Pocono Twp. Fire Co. for their assistance in positioning the rigs for photos. 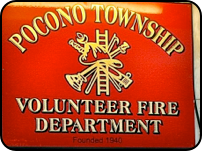 Pocono Twp. Vol. Fire Co.